The #WoolseyFire came through the ranch like a freight train and created a path of destruction like no other in Old Agoura. Thanks to an early evacuation plan and all the angels with trailers - all horses, donkeys, cows, goats and chickens were saved from this horrendous fire. Our beautiful haven did not have fire insurance because the insurance broker could not find an insurance company who would insure us because we were in a high fire zone. We desperately need the funds to rebuild what used to be not only my paradise I put my whole heart into building but the paradise that was built for the animals who lived there. The aftermath and damage this fire left behind is gut-wrenching & heartbreaking. Just over 80% of the ranch is gone. 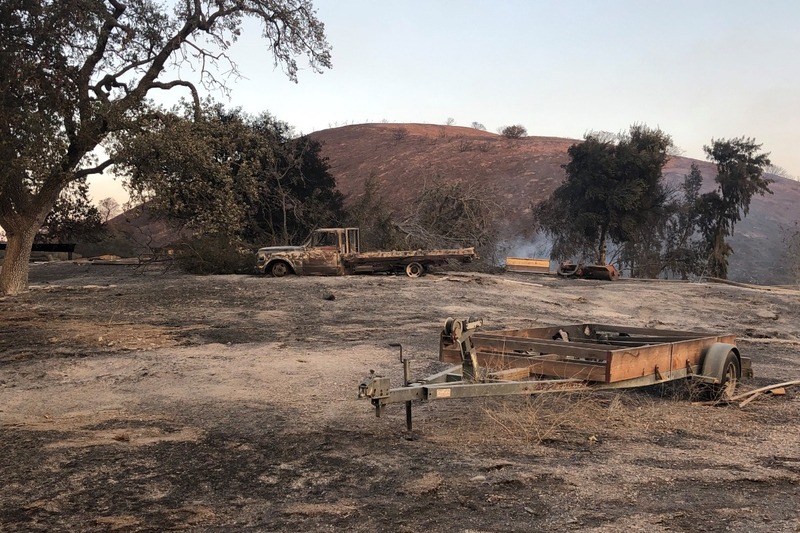 The place we devoted to rescuing animals in need, hosting clinics, lessons, meditations and the peaceful place we built for owners to enjoy their beloved horses, is gone. All the equipment that is essential to keeping the ranch running has burned. Tractors, UTVs (except one), Dump Truck, Bulldozer, Jeep, a Dune Buggy, 3 Utility Trailers, 10K worth of hay, the hay barn, the quarantine pens, 7 covered box stalls, 7 paddocks, the bull pen (that was just finished), the goat pen, numerous sheds, the Tee-Pee, the pasture fencing, fencing on the front half the property, more fencing near the arenas, the housing of the barn manager, countless pieces of expensive equipment, tools, antiques, the recyclable materials for the ghost town, horse shelters, feeders, muck buckets, water buckets, rakes, mucking forks, about 140 rubber mats, the roof of the portable stalls... the list goes on. Most of the structures that were lost were only a year old. 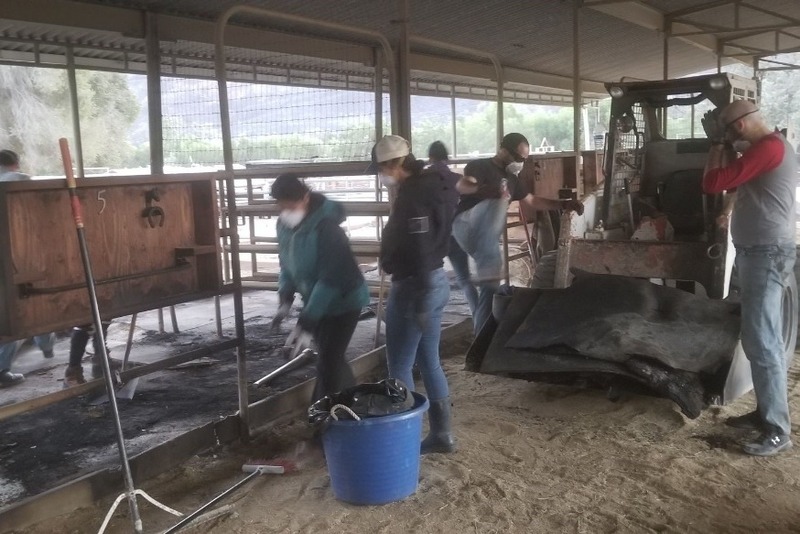 Amazing friends, boarders and volunteers are working fast to clean up and fix what is left so we can not only bring the ranch animals home, but it allows us to help bring in other animals who have no place to call home anymore due to other affected fire areas. This ranch really needs as many volunteers as possible to help us clean up! In closing, I personally want to say that I am so incredibly grateful, touched and emotionally moved to tears by the out-pour of support from boarders, friends and complete strangers I've received through this very difficult time. Everyone has been so amazing & kind to us and our animals. Thank you all for, from the bottom of my heart, for your support which has kept us going. After being denied by FEMA two weeks ago, I was denied by SBA Distater Relief today. Not getting financial help from any emergency organization. I'm on my own to rebuild the ranch. Thanks a lot. So all 600-800K that was lost in the fire will not be rebuild or purchased, except if I get donations. Praying for a miracle at this point. Thanks to all who have donated so far, we were able to buy mats for the main barn to replace the ones that burned. And with the help of amazing volunteers we should be able to bting some hordes home today. It is just the beginning....so so much still needed. Thank you to the volunteers selflessly helping us clean today!